இந்த முன்னோட்டத்தின் அளவு: 762 × 599 படப்புள்ளிகள் . மற்ற பிரிதிறன்கள்: 305 × 240 படப்புள்ளிகள் | 610 × 480 படப்புள்ளிகள் | 763 × 600 படப்புள்ளிகள் | 976 × 768 படப்புள்ளிகள் | 1,280 × 1,007 படப்புள்ளிகள் | 5,695 × 4,480 படப்புள்ளிகள் . 8:5, 16:10, அல்லது 16:9 உருவ விகிதம் உடைய இப்படிமம் கணினி அகலத்திரைப்படிமமாகப் பயன்பட உகந்தது ஆகும் (படக்காட்சியகம் காண்க). 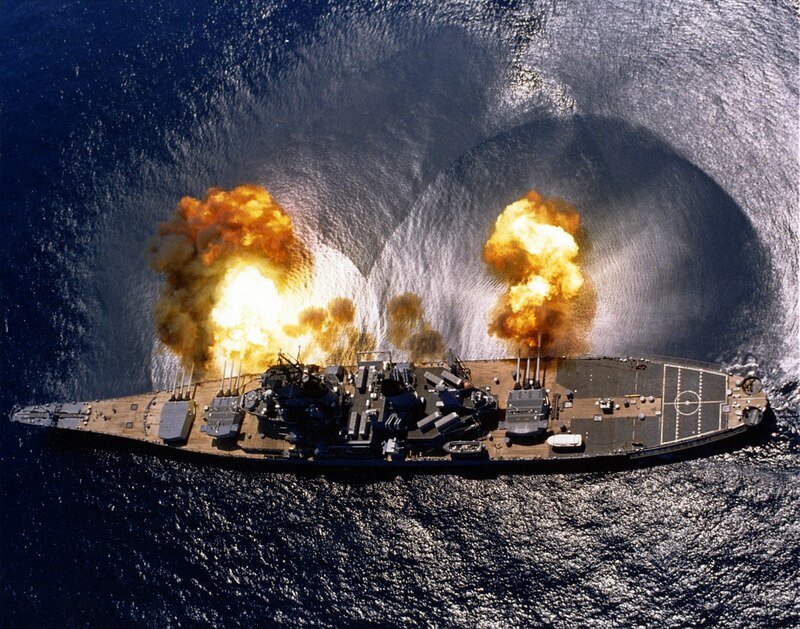 English: The Battleship USS Iowa (BB-61) firing a full broadside. Eesti: Sõjalaev USS Iowa (BB-61) tulistamas külgkahuritest. Español: El acorazado norteamericano USS Iowa dispara una salva de obús. Français: Le cuirassé USS Iowa tirant une salve d’obus de plus de 900 kg. Galego: O acoirazado norteamericano USS Iowa dispara unha salva de obús. Nederlands: Het slagschip USS Iowa (BB-61) vuurt een salvo langs de volledige breedte. Português: O couraçado norte-americano USS Iowa dispara um obus. Slovenčina: USS Iowa (BB-61) páli všetkými bočnými. Svenska: Slagskeppet USS Iowa avfyrar alla kanoner samtidigt. English: USS Iowa (BB-61) fires a full broadside of her nine 16″/50 and six 5″/38 guns during a target exercise near Vieques Island, Puerto Rico (21°N 65°W﻿ / ﻿21°N 65°W﻿ / 21; -65). Note concussion effects on the water surface, and 16-inch gun barrels in varying degrees of recoil. Deutsch: Die USS Iowa feuert eine volle Breitseite ab – während einer Zielübung nahe der Insel Vieques, in Puerto Rico. Zu beachten sind besonders die Knall- oder Stoßwellen auf der Wasseroberfläche. Esperanto: USS Iowa (BB-61) pafas per plena tirbordo per naŭ 16″/50 kaj ses 5″/38 pafilegoj dum ekzerco en celpafado apud Vieques insulo Puerto Rico (21°N 65°W﻿ / ﻿21°N 65°W﻿ / 21; -65). Rimarku efekton sur akvo kaj pafilegojn kiuj havas diversajn pafstatojn. Français : L'USS Iowa (BB-61) tire une bordée complète de ses neuf canons de 16 pouces (406 mm) et six de 5 pouces (127 mm) durant un exercice naval près de l'île de Vieques. Notez l'effet de souffle sur l'eau, et les canons de 16 pouces à différents degrés de recul. This media is available in the holdings of the National Archives and Records Administration, cataloged under the National Archives Identifier (NAID) 6396437. தற்போதைய 18:49, 14 திசம்பர் 2016 5,695 × 4,480 (20.58 MB) Signaleer Uploaded higher resolution image. USS Iowa (BB-61) Fires a full broadside of nine 16/50 and six 5/38 guns during a target exercise near Vieques Island, Puerto Rico, 1 July 1984. Photographed by PHAN J. Alan Elliott. Note concussion effects on the water surface, and 16-inch gun barrels in varying degrees of recoil. Official U.S. Navy Photograph, from the the Department of Defense Still Media Collection.